I’ve been a fan of experiential education since I was in high school. I remember sitting in algebra class factoring quadratic equations, thinking, “Why am I learning this, how will I ever use this in the future?” The teacher didn’t explain what a quadratic equation was used for (determining the area of a rectangle if the sides are increased). That would not have mattered to me unless I was expanding the floor area of a room and had to determine how much ‘70s-style linoleum I had to order. Although I can do the math now, over the past 63 years of my life, I never had to use it. I have difficulty remembering events and dates, except those that recur in historical movies, like “The Guns of Navarone” or Ken Burns’ documentaries. Movies, biographies and historical novels have been more helpful to me than history text books. Robert Fulgham wrote All I Needed to Know I Learned in Kindergarten. Learning to read and write, and a little math, opens the door to lifelong learning. Certainly, classroom instruction has its place — I wouldn’t want to be operated on by a surgeon who learned only by trial and error — but even the surgeon’s book learning is connected to observing surgical techniques. The surgeon acquires volumes of knowledge pertaining to the art of saving lives and improving health through a combination of study, observation and practice. I’m partial to experiential learning because I had the good fortune to be born into a family that urged us to push the boundaries of exploration from an early age. Our family moved to Alexandria, Virginia, when my father was appointed to a position in Washington, DC, by Senator Edmund Muskie of Maine. I was 13. Dad got me a job working at the Smithsonian. I was very excited. I pictured myself putting dinosaur bones together or hanging space capsules and bi-planes from the ceiling of the Air and Space Museum. The job turned out to be cleaning up and organizing the pharmaceutical division of the Museum of Science. It was interesting to see spring-loaded gadgets used for bleeding, hand-cranked drills for relieving pressure on the brain and remedies derived from animals burned to ashes (lizards that retained their shape). But the lasting impressions I have are about what was happening outside on the grassy mall. There were anti-war demonstrations and marches on poverty. Because Dad had been appointed by Senator Muskie, a Democrat, he was suspect under the Nixon administration. He and others observed that anti-war protestors were rounded up and fines imposed arbitrarily. Dad was told by friends in the administration that his phones were tapped. These experiences coupled with Walter Cronkite invading our living room with casualty statistics from the Vietnam War made a huge impression. Meanwhile, we read The Catcher in The Rye in English class. My cousin had an opportunity to go to Eastern Europe with her Russian class in 1970. I was invited to go along. We went to Moscow, Leningrad, Budapest, Krakow, Warsaw, and Vienna. We visited Lenin’s tomb in Red Square, the Winter Palace in Leningrad (St. Petersburg), the medieval cities of Karow and Warsaw. We met Polish soldiers who were very friendly, Russian soldiers – not so friendly – and common people in every country. The ills of communism became very apparent. The major department store in Moscow, GUM (pronounced “goom”), was comparable to a Goodwill store in the U.S. Products were spread out on tables with no marketing or brand names. Common people spoke to us in hushed voices. We were approached by people who bought cigarettes from us at three times the state’s rate of exchange of rubles for dollars. The Polish and Hungarians were much more open and less fearful of government spying. They retained cultural traditions, mostly consisting of drinking and dancing. What struck me most about Eastern Europe was how old it is. Stone towers, buildings and cobblestone streets date back as far as the 13th century. I realized how young our country is compared to those whose civilizations date back that far. The commercialism of our country looked more like a celebration of freedom than the trappings of wanton materialism when I got back. I felt inspired when greeted by Coca Cola ads and the Marlboro Man! A year later, our family moved back to Maine. I had a close friend in Virginia who is the son of an Army colonel. Col. Damron was our Boy Scout leader. He taught us survival techniques in the wilderness, including how to cook using a reflector oven that didn’t require fuel. We built shelters to sleep in and learned to navigate using a compass, maps and dead reckoning. My friend, Al, and I decided to do something special to have one, last memorable experience together. At ages 16 and 17, we hiked a 600 mile stretch of the Appalachian Trail. We trained by taking short trips to get in shape, bought gear with the help of our parents and mapped out a route that would take us through the Green Mountains in Vermont then up the Presidential Range in New Hampshire. We started going for distance — about 14 miles per day over rough terrain. Gradually, we realized we were missing a lot. Some of the stops along the way were beautiful, streams and waterfalls in the valleys and stunning vistas on the ridges. We met people who were going the same direction at about the same pace. We stopped for a day or two at some of the nicer places and shared experiences around the campfire. Some were young men of draft age agonizing over what they should do. Others were experienced hikers who had knowledge of where we were headed and shared tips on how to make the trip easier. We met a YMCA group of boys from an inner city led by a crusty leader who traded vulgar insults back and forth with his charges who delighted in torturing him. I read The Lord of the Rings on the trip. It added a mystical quality to our experience. The qualities of many of the characters in the books matched the characters we met along the way. Hiking along a ridge in the White Mountains above the clouds was like being in an otherworldly place where you might meet up with an elf or wizard. Once, during a drenching downpour, Al and I, and several fellow travelers ended up in a cabin with bunkbeds. The boys came prepared with candles. We had flashlights. While the boys tormented their leader, flicking candle wax at him, we shared about where we came from, what inspired us to make the trip. Places we had seen along the way. Challenges we knew that lay ahead. When the trip was over, Al and I said goodbye for the last time. I started my Junior year at Cape Elizabeth High, just outside of Portland, Maine. I wanted to share my experience with my classmates, so I started an outdoor adventure club. We did day hikes on weekends, or went skiing. 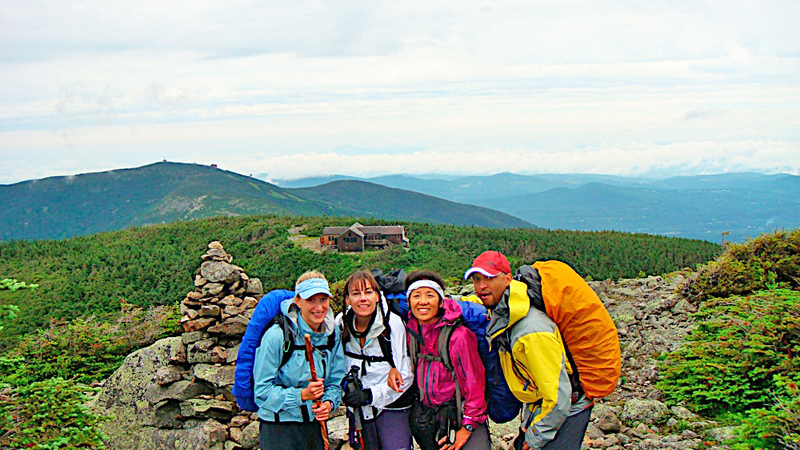 At the end of the year, we did a three-day trip up Mount Katahdin. Huddled in the cabins at Chimney Pond we talked into the night. Unlike the weekend party scene, here there was no drinking and carousing. It was an opportunity to open up and explore what was really going on inside each person. Out of that grew a “sensitivity group.” About eight serious students, with the support of a guidance counselor, met regularly. We built trust among ourselves and committed to confidentiality. My father once said he got into human services because he “wanted to find out what makes people tick.” I suppose that’s what I was after, too. I gave up going to one of the three good colleges that had accepted me: Dartmouth, Tufts and Colby. I found another group of people who were on a spiritual journey and had a clear sense of direction and purpose. That’s the community this Blog is affiliated with, so no need to go into detail other than the fact that we collectively achieved goals we set to do, then shifted to starting our families and making a difference in our communities — in many cases the very communities we left when we joined. I brought my wife, Jackie, and three children back to Maine. I took over the position of the state director of the American Freedom Coalition, the arm of the movement that worked with civic and political leaders and community activists. One of the missions of the AFC was to build relationships across political, racial and religious boundaries through service. That mission was formalized in an organization called Service For Peace. Some members were oriented toward conducting educational conferences; I was more inclined to action through service. The SFP activity focused on youth. We didn’t have a lot of young people in Maine, and it was apparent that the ones we did have would be aging out of SFP. I was an active Rotarian at the time, so I started an Interact Club (Rotary for high school students) at the high school our children attended. I was fortunate to have two outstanding faculty members who volunteered to be advisors. I partnered with other youth development organizations and non-profits to create volunteer opportunities in the greater Portland area. One was with an adventure-based organization on an island. Our first project was to take a ride on the Duck Boat (amphibious tourist vehicle) out to the island and remove an invasive plant species. 70 students volunteered. The club has been active ever since and done a multitude of projects from island conservation, construction with Habitat for Humanity and serving families in need through soup kitchens and Toys for Tots. These activities are still happening, and sometimes I meet young adults now well into their careers who tell me what a difference those experiences made. Now that my adult children are well into their own careers, my life took a new direction. I started working with people with disabilities. Five years ago, I worked with an agency in its employment services department. It was tiny compared to other departments, particularly residential services with 27 residences and 400 employees. There were only three job developers. But I loved the position. I worked one on one with clients at their own pace, working to achieve their own goals according to their schedules. The position involved a lot of creativity, collaboration and faith. Three years ago, I started working with transition students, who are graduating from high school. Many are on the autism spectrum. Last year, Maine’s Department of Vocational Rehabilitation did a pilot project on “Progressive Employment.” VR is reaching down to the sophomore level in high schools to begin career exploration and job seeking skills at an early age. I was one of the Employment Specialists who participated in that program. I worked on two tracks. First, what is the student’s long-term goal? One knows she wants to be an author, another knows he enjoys anything mechanical, another wants to be a marine biologist, another a chef. I worked with student counselors, Special Ed teachers, trades teachers, families, behavior health providers — a student’s team to support them in the areas they are passionate about. Maybe a student can’t fulfill the academic requirements to be certified in a particular field, but we explored other positions in the field that may not require certifications. The second track is developing soft skills — how to relate to a supervisor, following rules and procedures, communicating with customers, overcoming anxiety, coping skills, relating with co-workers. All of these skills are best developed in entry level jobs. That means finding business partners who will take on the students, setting up work assessments and job coaching on the job. We had very good success last year. However, my agency decided not to renew its contract with the Department of Vocational Rehabilitation and my position was eliminated. But, I had already decided to go out on my own last spring, had an S Corporation set up by August and met VR requirements to be a Community Rehab Provider at the end of November. That happened the same day the agency’s contract expired. Now I can work in the field of experiential education for people with disabilities independently. But here’s the question. If this approach — building a curriculum including actual experience in the community — works for people with disabilities, why wouldn’t it work for mainstream students? In other words, like the Progressive Employment model, why not support a student in a direction they want to go including exposure to people already in the field? We do have students who have no idea what they want to do in the future, of course. Their plan begins with “career exploration.” They have an opportunity to visit different businesses and organizations to see if they might have an interest in one. Often, students discover that what they thought would be a good field for them isn’t what they expected. Better to find out sooner than later. The model works because there are business partners who are willing to open their doors to show students how their business operates, and job developers who are a bridge between the school and the community. Some businesses are willing to host VR paid apprenticeships for students who are not yet capable of working up to a standard an employer is willing to pay for. And others welcome young learners with apprenticeships, putting them on a career path where they progress to greater levels of responsibility. Of course, a lot of this happens at the post-secondary and graduate levels. Here we’re talking about high school Sophomores beginning with career exploration, Juniors and Seniors taking entry-level jobs, so that transition students, by now, have a sense of direction and meaningful educational experiences that will follow them throughout their lives. One of the most frequent diagnoses of students who are struggling in high school today is anxiety. It is increasing, especially among Juniors and Seniors who have no idea where to go after high school. Although there are effective anti-anxiety and anti-depression medications that can help, much of the emotional and mental illnesses are related to the uncertainty and ambiguity about their futures after the predictable routines in school are over. Children used to grow up on farms or take on jobs in factory towns at an early age, and learned from elders in the family and mentors. They were secure in the knowledge of where they were headed in their jobs or careers. Schools had two tracks, one to prepare students for college and management, the other to prepare students for labor. The work environment has changed drastically since then. It is multi-faceted, complex and constantly changing. Students need mentors more than ever, but frequently for guidance their families cannot provide, and often for support their teachers aren’t able to provide. Educators are coming to realize this and gradually building curriculums to support the student’s experience-based interests. Scott Simonds has been a Unificationist from 1973. He served as a state leader in three states, was a captain of a Sunrise shrimp boat, and ran the repair division of Master Marine handling contracts for paper companies, the Coast Guard, Army Corps of Engineers and fishing vessels. He was active with the CAUSA Ministerial Alliance at the time. He returned to his hometown in Maine and was appointed state leader of the American Freedom Coalition where he focused on inter-religious cooperation with Service For Peace. He has worked with people with disabilities as a direct service provider. This year, Mr. Simonds started his own agency, Career Journeys, which began operation December 18. Photo at top: Hiking the Presidential Range in the White Mountains of New Hampshire. Thank you for the peek into the thread at the center of your life with all of its twists and turns; returning, inexorably, to that “celebration of freedom” you observed those many years ago. May “Career Journeys” truly shine as a beacon as well as an example of true parental caring and guidance in an age sorely (ever) needing such. Happy New Year. I read this with great interest and respect, and appreciate your approach to your work and calling. I wish you success and many profound insights in what you are doing. Thank you for your enriched experiences and insightful advice on experiential education. I am inspired by your article, especially some activities that you mentioned. With the experience, skill and passion that you possess, I am sure that lots of our second gen. can learn and be benefitted from. Wishing you good luck in your endeavor in “Career Journeys.” By the way, what’s the website of your agency? Thanks for this inspirational update on your life. Indeed there should be more opportunities in the mainstream classrooms for innovation and for the tracks students are offered. I have a lifetime of “listening” to teacher talk. My grandmother was a teacher in a one room school house in rural Nebraska. Her two daughters, my mother and Aunt, were both elementary school teachers as was my father (6th grade), one of my girls teaches First grade in Manhattan and my wife retired two years ago after 18 years in the public schools, the last seven at a middle school in Reading, PA. Poverty and broken families lie at the center of a crisis in urban education. I have so many stories from my wife and daughter, it boggles the mind. But, there are amazing and innovative things happening in many places. My daughter has a teaching artist come in to her class to teach movement and dance, their field trips include the MET, the Natural History Museum and more. I have no doubt you will continue to thrive and add value to your workplace and to those your work with and serve.